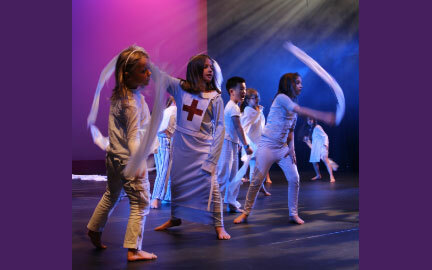 Every school holidays Kids Up Front works with enthusiastic boys and girls to put on a fabulous Musical Show. Our July Theme is ‘SUPERHEROES’ . Tom Rimmer is creating an original script where every child will have a character to play. We will be at Raye Freedman Arts Centre for Five days commencing Monday 16th to Friday 20th July. In the morning the children in their age groups rotate around our specialist tutors and complete a 45 minute session each of singing, dancing and drama. The programme culminates on the Friday with a wonderful musical show at 3:00 pm for parents and friends to enjoy. At the conclusion of the show the week is complete. Our performing arts holiday workshop runs from 9:00 am to 3:00 pm and with extended hours included it makes it a very popular school holiday choice. To suit working and/or busy parents the extended hours are 8:00 am to 5:30 pm except for Show Day which finishes after the show, usually about 4:00 pm. Our Five Day program offers some flexibility. If you would like your child to try a couple of days before booking for the full five days we suggest to make them Monday and Tuesday, you can always extend at camp if you would like to. For your child to be in the show on the minimum booking needs to be three days. We do not accept two day bookings to include show day. Social interaction and team work skills are built through fun drama games and both boys and girls enjoy the fun and funky contemporary dance and are welcome to contribute their own ideas and moves. The children’s confidence in performing and character development grows throughout the week as they perform for their peers and work together to create a great show.